This map shows the coverage of the Fixed Point Surveillance (FPS) network. The FPS network monitors the public doses of radiation from radioactive materials in the air in Canada which also assists to make Canada better prepared in case of nuclear or radiological incidents. 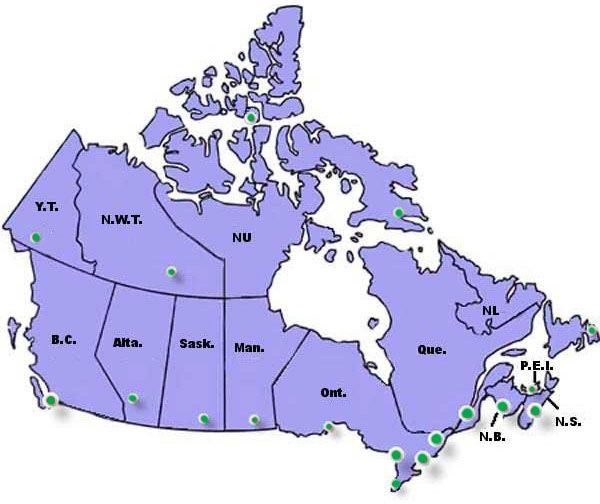 The network is organized into systems which monitor radiation around the six major Canadian nuclear facilities, ports where nuclear vessels may berth and in many population centres across the country. Please roll your mouse over the dots to see the location of each of the monitoring stations in the network. (The larger dots represent multiple stations in close geographic proximity). Clicking a station name will display the most recent dose data for that station.